We have published three versions of this map, showing how the area developed across the years. The maps each cover the same area, with Willesden Green in the NW of the map, Brondesbury in the centre, and Kilburn High Road to the east. Cverage stretches from Lechmere Road eastward to Lowfield Road, and from Teignmouth Road southward to Paddington Cemetery. Features include Willesden Green and Kilburn & Brondesbury stations on the Metropolitan, also Kilburn High Road on the Hampstead Junction Railway; Mapesbury House, Mapeshill House, Grange Brick & Tile Works, Shoot-up-Hill, Lady Adelaide Home for Boys, Maria Grey Training College, West End Sidings. By 1912 the Brondesbury Park Estate is being developed, and the map is much more built up. Each maps includes extracts from street directories; the 1935 map includes the street entries for Brondesbury Park and Willesden Lane. The map links up with London Sheets 26 Cricklewood to the north, 35 Willesden to the west, 37 Swiss Cottage to the east, 47 Kensal Green to the south. 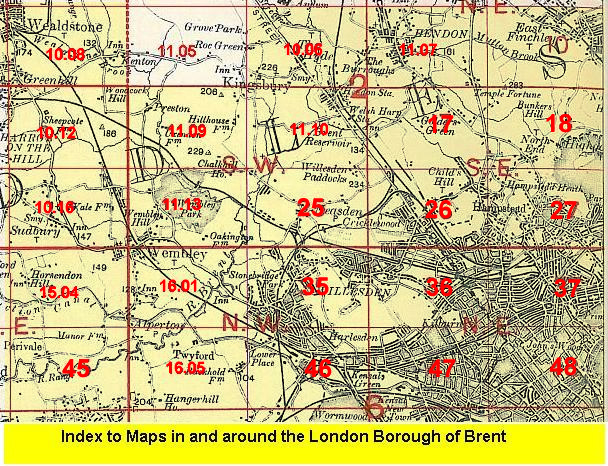 Follow this link for a list of our maps for the London Borough of Brent, or here for a complete list of our London maps .